The most thumbed gardening book I own is Joy Larkcom’s Grow Your Own Vegetables. It is easily the best book I bought when I got my allotment and urgently needed great practical advice. And while I chat about that we can take a potter around the allotment and check up and see how things are growing. It’s the book I turn to time and time again. To remind myself of the dos and don’ts. To verify an insect or a disease. 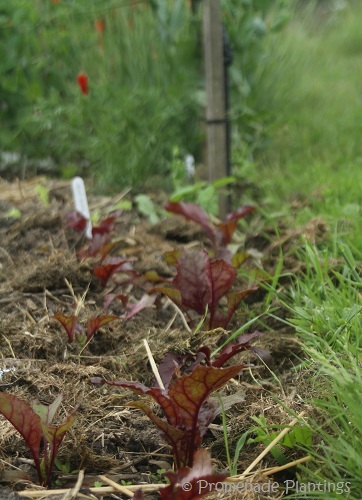 To check up on the practicalities of growing a certain vegetable. A book to turn to when I have questions that need answering. 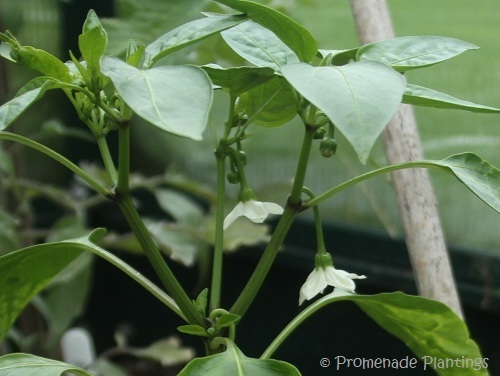 It’s plain and simple – a no frills approach to gardening. No big glossy photos or life-style statements, just a few simple hand drawings with easy to read directions. And all the time you are reading it, you know she has grown the fruit and vegetables she’s writing about, she has tried the different techniques, she has built her soil up, she’s dealt with pests and diseases. Her words give you an understanding and a confidence. Packed full of practical advice on how to set up a vegetable garden, to build and maintain a compost heap, pruning and propagation techniques, the tools you need and of course the how to sow, plant, care for and when to harvest. So practical and yet so easy to read. I’m not blinded by science or bombarded with opinion. Gently but firmly is it written. And now of course with blogging, if I want to understand something a bit better, or if a fellow blogger asks me a specific question I flick through the pages, many with highlighted passages others with sticky-notes attached. And there is the answer. And then of course there is her fabulous book Oriental Vegetables, best we leave that for another day! For more info on Joy Larkcom take a look at the Guardian and Waterstones, where I’ve discovered there is a new(ish) book out called Just Vegetating A Memoir…. credit card at the ready…. Do you have a favourite garden read? Previous Post Previous post: Guess what we’re having for dinner? Everything is looking so beautifully healthy! You clearly have green fingers (with or without the help of Joy Larkcom’s book. Thanks Mandy, that made me giggle! I’m so impressed with all the hard work you’ve done on your allotment and the results are amazing. That’s very kind, I keep looking at it thinking it’s looks a bit lack lustre – our weather is not being kind to us – I shoul djust appreciate what I’ve got, but that is easier said than done ! Looking good, looking good! I don´t have a favourite gardening book, we have a few Spanish ones here. I do like the H Fearnly Whittingstall (or however you spell it) Rover Cottage Year and Nigel Slater´s Taste books as they inspire me “seasonally”. River Cottage…not Rover…mind you, that sounds rather fun! Your garden looks great. I am going to check out the book. Thanks for the recommendation. I figured the seasons might be different. Few books directly address the seasons of Southern California (zone 10a). I am sure there will still be lots of useful info. I too am a big Joy Larkcom fan. I have that veg book and the Oriental veg one . Both equally fab. Joy now lives in southern Ireland I do believe. I think you are right about her being in S Ireland. She’s such a wonderful gardener, and that said in a world of “celebratory” where she definitely seems to have avoided taking that path! I like Wendy Johnson’s Gardening at the Dragon’s Gate. There’s plenty of science in it, but lots of stories, too, and beautiful line-drawings by Davis Te Selle. I had not heard of Joy Larkcom. 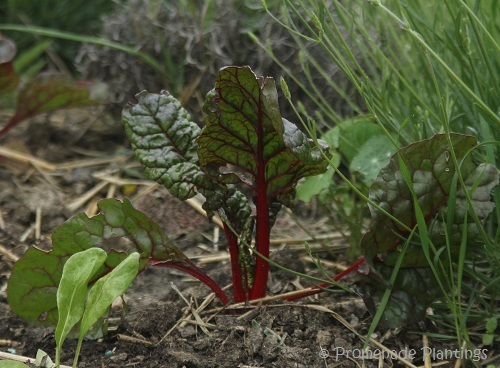 I saw beans, chard and beets in your allotment photos — did I miss something? 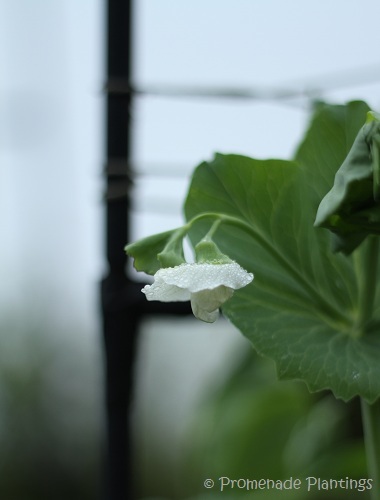 Well there are pea flowers (no peas yet), french beans and shelling beans have been planted but are probably out of shot, sweet peppers and their flowers, lots of salad leaves, and radishes. What lovely, lovely garden photos! What a beautiful garden it must be! Thanks for sharing these images, and for the book recommendation…I’ll look for it. My current favorite is Designing the New Kitchen Garden by Jennifer R. Bartley, but the book I turn to most often is an old copy of A-Z of Popular Garden Plants. It’s a good reference for propagation, pruning and climate. Thanks for the walk around your allotment! Hi Cindy, lovely to hear from you and thanks fo rthe compliments, as ever I look at the garden and think it could be better, so I need to accept where I am and enjoy it! And thanks for your suggestions I’m off to have a look, sometimes it’s the simple straight-forward ones that are the most appealling – particuarly when you have dirty hands already!! The plot looks great, the splashes of red are lovely. 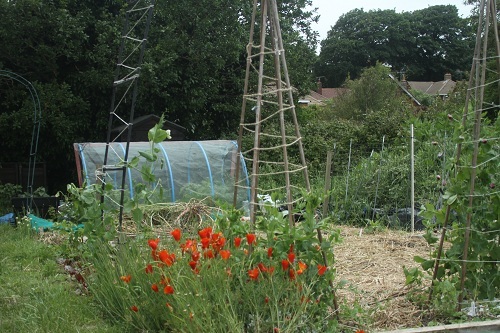 I was given a present of Alan Buckingham’s ‘Allotment – Month by Month’ which is my go to book. I also dip into ‘The Vegetable Expert’ by Dr D.G. Hessayon, not very organic though when it comes to disease and pests. Hessayon is excellent but as you say not exactly organic. But the whole series is superb, I know I have them and refer to them as well. I haven’t come across Alan Buckingham, so that’s anothe rone for me to look into – thanks! Thanks, it’s taking it’s time, we need more warmth!! That book sounds great, and your garden is looking fantastic! 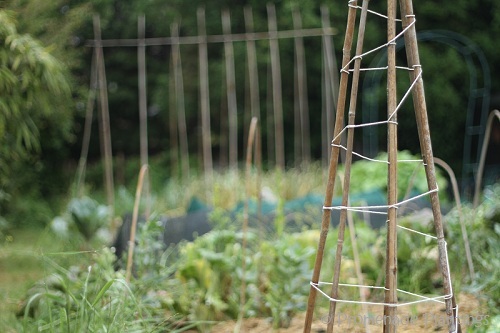 Everything looks so healthy, and I love your pea trellises. I don’t have one single go-to gardening book, but there are a few I really love. A Way to Garden by Margaret Roach is great, sort of half memoir, half how-to. (Her blog, awaytogarden.com is fantastic too!) A new one that has inspired me lately is The Year Round Vegetable Garden by Niki Jabbour. Seed to Seed by Suzanne Ashworth is fantastic if you want to learn more about saving seed. I’ll have to look for a copy of Grow Your Own Vegetables. Thanks for the recommendation! I am inspired to garden whenever I pick up either of the Nigel Slater “Tender” cookbooks, as they are as much about gardening and the seasons as they are about food. Nice garden by the way! That sounds a very inspiring book, I love the idea of chicken power! But seriously it makes so much sense, friends have chickens in their back garden and all the veggie peelings and bits get munched up, and around the loop it goes. The allotment is looking very good. I enjoyed seeing the cane cages that you have made…art in your garden. Thank you Karen, they do add a bit of sculptural don’t they. I always think it’s summer when I put the bean canes up! Those veggies are coming on nicely! 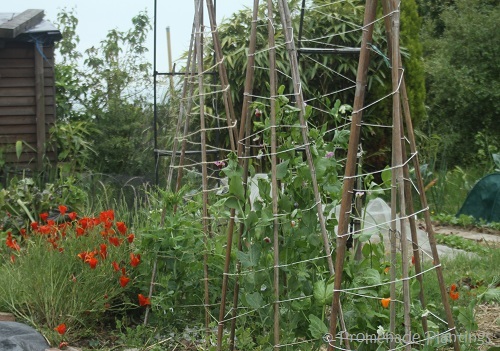 I love seeing how your allotment is springing to life. Thanks for sharing your thoughts and th eoutstanding photos. Very kind of you. The garden has been slow to take off this year, I know I’m repeating myself here but we need WARMTH and we need it soon!! So much to learn, how does one ever know it all! Thought of you today when I went to a fabulous nursery and came home with edibles and flowering plants. So fun! I don’t think we will ever know it all, and just to confound us every year is slightly different – weather, bugs you name it! Your garden looks so healthy and I can’t wait to see all the things your will be harvesting soon. 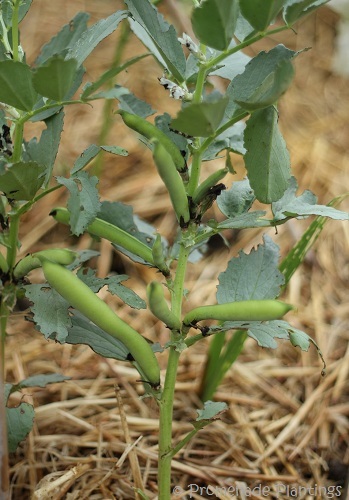 Thank you BAM, I think the first off the plot will be the broad beans swiftly followed by peas – well I hope so! That’s quite the garden you’ve got going.. must be all that useful information in your book;) and a little elbow grease I think! 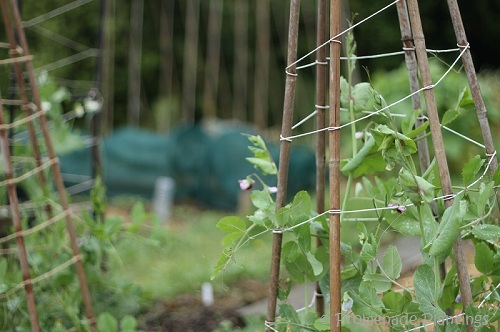 I want to grow peas.. could I plant a simple circular trellis like yours and pop in a few seeds?? 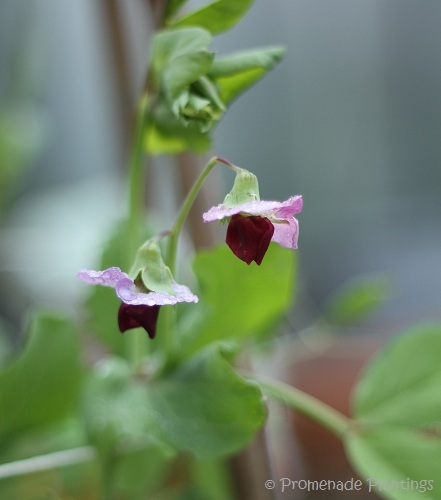 Your garden is a pleasure to look at… and the book sounds wonderful. I bet your mum’s advice is the best and most practical. And what a great gardening background you have had. My mum was a very keen gardener but didn’t grow fruit and veg, my brother is a gardener and I’ve persuaded him to get an allotment too, so now we can share ideas and advice! 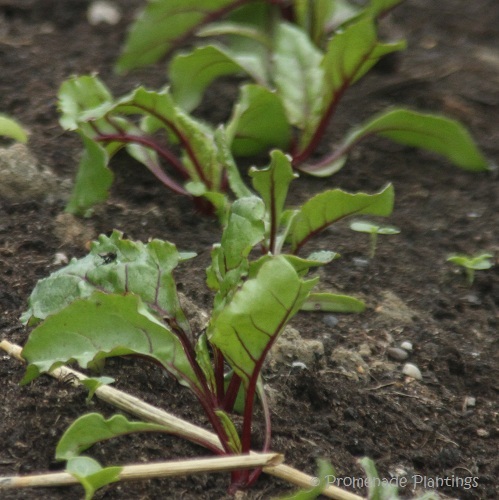 I have been looking for a good vegetable gardening guide–thank you! It’s so exciting to see your garden flourish! Very much enjoyed the intimate photos of the of the vegetables reaching for the sun. Thanks for sharing some of your magical garden. It would seem that Claire has two hands full of green thumbs! I love how your garden grows – and though I hear you say it’s “patchy” it looks quite wondrous to me! I’ve got “space” for a garden and perhaps when the work crews have left here, I’ll get some cold weather crops in. Sadly, I’ve missed beans this year, but that means I get to support some local farmers which isn’t half bad either. Thanks for the inspirational tour of your garden Claire! I think supporting your local farmers is a fantatsic thing to do on all sorts of levels – from great fresh food, to creating jobs. Ooops I forgot to say thank you for the thank you 🙂 Hope you have a super week! You are doing Ms Larkcom proud, as they say in the southern States. I’m new here – this is the first post I’ve read but it won’t be the last. Thanks for the tour round your productive plot.